For decades, the US Army’s MPs have gotten the short end of the stick. Given the mission of protecting the rear areas of any military ground operation, they have long been forced to rely on deploying unarmored HMMWVs with only one of the Heavy Squad’s weapons mounted on the roof. After land mines destroyed a few Hummers in Kosovo, they got some shiny new M1114 uparmored HMMWVs, but only a few. They got a lot more of them for operating in Iraq, too. However, Iraq got them something better than a HUMVEE. In Iraq, they get to use the M1117 Guardian Armored Security Vehicle. 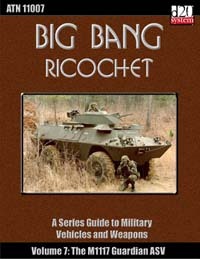 A direct descendent of the old M706 armored cars used by the Air Force for base security, the M1117 is a state of the art light armored vehicle to meet the transportation, protection, and firepower needs of the MP Heavy Squad, a team of three men that must lug around and deploy both an M-2 Browning .50 cal. MG and a Mk. 19 Automatic Grenade Launcher. With the Guardian, both weapons are turret mounted in a fashion that keeps all weapons activity, including reloading, under the protection of the vehicle’s armored shell. Additionally, with a top speed of 63 mph, it is designed to move faster than trasport vehicles in convoy, making it an exceptional route scout and convoy patrol vehicle. To date, at least 20 men are alive specifically due to the Guardian ASV, surviving three RPG attacks and two roadside bombings, losing only a single M1117. All five incidents would have destroyed even the M1114 Uparmored Humvee.